Alison leads Yoga Teacher Trainings, workshops, retreats, women’s groups nationally and internationally and works one on one with people to facilitate healing, growth and empowerment. Alison got her undergraduate degree from University of Maine, Orono in 1990 with a BA in Interpersonal Communications. After graduating she moved to Boulder, CO and became interested in yoga and began practicing both Iyengar and Ashtanga Yoga. She travelled to Mysore, India in 1997 to study Yoga and Ayurveda then came back to Boulder to continue deepening her practice at The Yoga Workshop. At that time, she completed her certification as a Rolfer of Structural Integration at The Rolf Institute in 1998. Soon after she took Richard Freeman’s first Yoga Teacher Training intensive in 1999 and taught yoga for many years after that as one of Richards Senior teachers. Her teaching style is also strongly influenced by the Tantra traditions taught by Sally Kempton, Douglas Brooks, Shiva Rea and Chamelli Ardaugh as well as some of the principles of Kundalini Yoga. 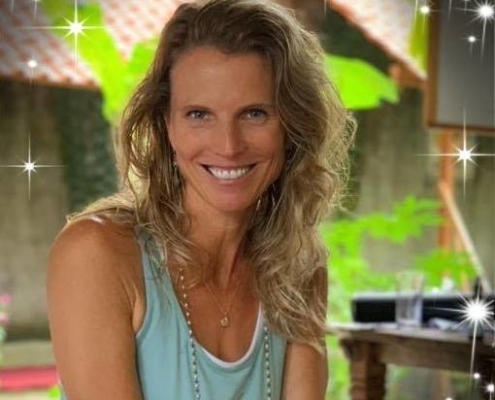 She is an ERYT 500 Yoga Instructor and founder of Embody Radiance Yoga School here in Boulder, CO. leading teacher trainings and continuing education for teachers, and women’s embodiment courses. Alongside with her yoga practice and passion for healthy living, Alison also spent many years studying holistic nutrition and cooking both with with Mother Maya through the Wise Earth School of Ayurveda, the School of Natural Cookery in Boulder, CO. and in Italy and Morocco with Peggy Markel’s Culinary Adventures. She is also co-founder with her husband Travis Robinson of Peak Frequency Life, a business and online platform supporting the shift to a conscious lifestyle with empowered purpose and optimal health through the proper use of peak frequency foods, herbs & pioneering information that transforms surviving into thriving! Currently she is studying to become a practitioner of Raphaology medicine with her teacher Morning: Spirit: Wolf-D.R.M. She has a sweet home studio in downtown Boulder, CO. where she currently offers bodywork and healing sessions as well as small, intimate yoga classes, privates, Teacher Trainings and workshops. She is a mother of two amazing boys 10 and 14 and in partnership with her beloved husband and father of her boys. Her personal vision and mission is to be a clear channel for healing and transformation, empowering people to their full potential. She experiences herself as an empowered feminine leader, teacher, practitioner, mother, wife and active community member. Her vision is to live in a world where love and freedom bring a sense of peace and all beings are thriving!! Alison has written these articles and more for Elephant Journal. Check it out…. I lost my mother to cancer when I was 21. Losing a parent at that age was a huge initiation into realizing how fragile and temporary life is. The loss of my mother very quickly diverted me onto a spiritual path of seeking what was meaningful in life. I had a lot of questions and it was a great time of disorientation for me. A year or so later, I came to Boulder and I found healthy food, yoga and outdoor lifestyle. When I first landed in the foothills of the rockies,, I felt like I had come home. I was an avid skier, climber and mountain biker at the time. I soon found yoga or yoga found me which allowed me to settle into my body in a whole new way. Syncing my breath with movement and letting go of the armor and resistance I had put up around me, allowed me to feel what was really present. I not only begin to heal the grief I was holding but it guided me onto a path of learning how to feel in a much more authentic way. Before that, my pattern was to disassociate whenever things got uncomfortable and to try hard not to show my vulnerabilities. I tried to be perfect and not let anyone see what I was really feeling. It was how I coped as a sensitive being when I was a child. The path of yoga has been a path of getting to know all parts of myself and bringing them into wholeness. It continues to guide me and give me the courage to walk this life with a sense of ground and an open heart and to love my body, accept myself and trust that life has me and that is enough. Because my life profoundly shifted with the impact yoga, nutrition and ample time in nature and community has had on my life, I am grateful to now share these gifts with others. Teaching embodiment and educating people about how to live in and care for their bodies wholeheartedly is my passion and love. I invite you to let go of everything you think you need to change about yourself and realize who you are, in your truth, your strength and your vulnerability, held in a container of love. Then from there, allowing the transformation to occur. The Yogi’s say that everything you seek, is already within you. Everyone has the capacity to heal and empower themselves and I’m here to tell you that you don’t have to do it alone. We actually can’t do it alone. Through loving and honoring our bodies on every level and slowing down enough to see who we are and what our potential is, we can uplift and create healthier and more joyful, inspired lives!